Praise the Lord, Oh my soul! It is the weekend. The Ballet Magnificat Alpha and Omega companies perform 'Light Has Come' for the SDI students this evening. People keep asking me if I am excited to dance for the students. I tell them, "I'm not as excited about the performance as much as I am excited for the ministry that will follow and for seeing lives changed." 'Light Has Come' is such a powerful display of the gospel and I know without a doubt that the Lord is going to use it mightily to draw people to himself. Would you keep all these young souls in your prayers as they are being bombarded with the gospel here at our summer camp? Pray for those that do not know Jesus personally that they would come to taste and see that He is good and that He is completely worthy of our trust and full surrender. Pray for those that do know him, including me, as well as the other Ballet Magnificat staff and faculty that we would be encouraged and refreshed in Christ. A student gave their life to the Lord on the first day/move-in day! Several other students surrender their lives to the Lord later in the week, including two from my small group! What a blessing and honor for the Lord to give me the opportunity to witness these hearts changed. Though fireworks are not permitted on the Belhaven University campus that we are staying on, my group and I did not fail to celebrate the 4th of July. On the night of the fourth after Bible study we streamed the '10 hours of fireworks' video on Youtube (who knew that something like that existed!? ), ate junk food and sang patriotic songs from the top ouf our lungs. It was very fun. I made delicious birthday popcorn in the dorms to celebrate fellow company member Abbey's birthday. It was very delicious and made our whole hall smell good. Our very own Claire from the Ballet Magnificat Trainee Program unexpectedly got promoted to the Alpha touring company this past monday! 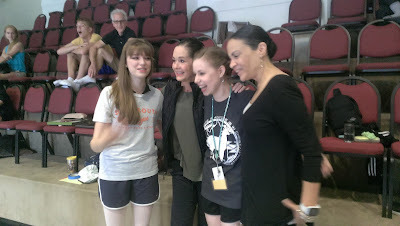 An Excited Claire, Kathy, Claire's happy sister Emma, and Sol pose for a picture. We had two powerful Creative Worship evening events this past week. I got to help lead the first one of the summer. We based it on Ephesians 2:1-10. The Lord taught me quite a bit about myself vs. Him during the process. The video below is a clip from the second Creative Worship event. Each morning at our summer dance intensive we start our day by coming together to sing worship songs to our God and then different company members share their testimonies. I was super encouraged by my friend Elisa's testimony that shared with us this past Tuesday. She read to us one of her favorite childhood story books called 'You Are Special' by Max Lucado and I was surprisingly super blessed by it! Though the narrator's voice is not as sweet as Elisa's voice was reading it to us, I've included the youtube video below of Max Lucado's story so you can be blessed by it too! It is amazing how something so simple and innocent can contain such deep and impactful truths. I always find it a challenge to stay humble and not boast in myself during SDI season with so many eyes looking up to me. Just when I found myself getting prideful about the Creative Worship presentation my group threw together, I started to feel insecure about it thinking it wasn't 'good enough'. Unfortunately, this led me to an embarrassing emotional breakdown. I failed to see how in the end, people giving their lives to the Lord never has anything to do with my works or efforts, but simply by the power of Jesus himself doing the work. The Lord brought to my mind the story of Peter walking on water and how when he took his eyes off Jesus and started to doubt he began to sink. I felt like I was sinking because I took my eyes of Jesus, put them on myself, and lacked the faith to believe that Jesus was more powerful than my own efforts forgetting that He's the one who does the work and that it is a privilege when He chooses to do it through me. I don't know if I am making sense...but basically, I lost perspective for a time, learned a lot that night, and was put back into my place. Once I repented refreshing came, and regardless of my emotionally unstable state that night, I'll have you know that the Lord still worked mightily! Acts 3:19 "Repent, then, and turn to God, so that your sins may be wiped out, that times of refreshing may come from the Lord"
Please pray for fruitful ministy times that are held after each company performance. As we head into our second week of the SDI please pray for the students and counselors alike that we would be guarded against injury and illness. Pray for the students who are preparing for their first gala performance this weekend. That as performers they would dance well, have peace, and be deeply effected by the truths they are portraying through dance to songs with worshipful God glorifying lyrics. Pray that the audience members at the student gala performance comprised mostly of family and friends, would be deeply impacted, encouraged, and refreshed by the pieces their children are dancing to. Pray for continued deliverances, healings, and salvations. Well I guess I better get ready to put on my tiara and ballet shoes. It's going to be a great night! Thank you for your prayers and support!